In my recent post regarding my diagnosis of depression, I was apprehensive, and a little afraid; having no idea what to expect from sharing something so personal. What I received was an outpouring of love and support that exceeded all my expectations. Your comments and emails have touched my heart. I sincerely, and gratefully thank you for your incredible kindness during this challenging time. Knowing that I could be honest, and share what was really going on, has a lifted a burden that I haven't known how to carry alone. I had two doctors appointments yesterday, both assured me that I'm on the right track, and I'm moving in the right direction. The next step to finding out what is causing these headaches...eye appointment, sleep study, then the neurologist. 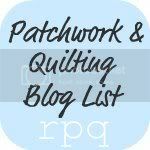 This blog is about quilting, and I'll get back to that as soon as possible...I miss it, and I'm itching to sew. Thank you again for your understanding, and your kindness. Many of you have shared your journeys through depression, and I'm grateful for your openness...a new sisterhood I didn't know existed. This is completely personal, and not quilt related; by the end of the post I hope you will understand my sharing this bit of my life. A week ago I checked myself into a hospital for severe depression, and it was the best thing I have ever done for myself. THE ONLY REASON I SHARE THIS is in hopes of helping someone else who may be suffering. I've suffered with clinical depression off & on throughout my life, but due to the headaches I've been having since February (and are still unresolved) I finally got to the end of the road. My upbringing is all about getting over your problems, pushing ahead, not feeling sorry for yourself, and moving forward. Well, I had tried all of those things, until I just couldn't try any more. I went to my family doctor, and he suggested that I check myself in a hospital specializing in what I was going through. Normally I would have fought the suggestion, and said, "I'll be fine, it's okay"; because that is the standard answer in our family...but not this time, I was too exhausted, and too tired of fighting. So I drove to the hospital, checked myself in...it was not what I was expecting! I thought I would get to sleep 12 hours a day, and get feeling better...no sir. We had lots of group therapy, individual therapy, and one on one sessions with doctors. What a blessing walking in that door was for me...and hopefully my family. Currently I'm in an outpatient program for the next two weeks - what a blessing this is as well. The staff at this hospital couldn't be kinder, and more genuinely concerned with my well being. In case you're wondering, my diagnosis is Major Depressive Disorder; I was grateful it wasn't anything more serious...not that this isn't serious. So, that's where I've been, and that is what I've been up to; for once in my life, I'm taking care of myself. My Mom has been here for the last month, and I couldn't be more grateful for her kindness and support. Ashlee is coming in today, and I cannot wait to see her. I'm heartbroken about not attending market in SLC, but that is okay; there will be another one in less than 6 months. I still have to have the batting drawing, which I haven't forgot about about; plus our quilt along show & tell. Thank you for your patience, your kindness, and your concern about my headaches. I've felt your prayers and I'm more grateful than you will ever know. Going through all of these challenges, I knew that I was never alone. p.s. 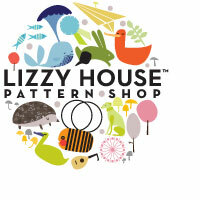 the reason the blog post say Lizzy House at the top, is that Lizzy & I share a typepad account. If it's signed Cherri; then you know it's me...the Mom, not the daughter. Don't you love it when something comes together so perfectly...I do! Saturday I reached out to the Baltimore MQG in regards to the quilts needed for the head start program. Also, a few days before I was contacted by a Natalie, president of the DC MQG offering their assistance with the needs of the program. I am so happy to say that the Baltimore MQG, along with the help of their DC neighbor is taking over this effort, and will be running the show from their part of the world. Heather, the B'more MQG prez and my Melissa are getting together, going to the center to do an inventory of the boy/girl quilts received to determine what is still required. We still need lots of quilts, but now we will have someone there to be hands-on and let us know more accurately what they need. Also, the B'more MQG has graciously offered to adopt the head start program as their guilds official charity ♥♥♥ If there are any modernish, contemporaryish, 'the traditional guild setting is not right for me' kinda quilter, hop on over, and join in Baltimore or DC's growing, wonderful modern quilt guilds. Thanks to all of you that have sent quilts, or are sending quilts to this cause. I think what has touched me the most are the numerous emails and comments that I have received from you, saying that you had a little quilt on hand, but didn't know where it's home was, and now you do! What a beautiful pairing that is, to fit the right quilt with the right person or cause. I know all of our hearts are broken over the devistation in Japan...I'm looking forward to participating in some meaningful way when it is determined what they need most. Who's counting the number of boy/girl quilts so we don't have an imbalance? No one at this point, since the program is in Baltimore, and I'm in Houston. The program director can advise us if there is a significant imbalance, and we correct from there. The photo of Melissa carrying 20l of water...this photo has absolutely NOTHING to do with the Baltimore Headstart program, I just thought it was a sweet photo of Melissa, in her Community Health class, where she is learning about the shortage of clean water world wide. Any other questions I didn't cover, just let me know. Thank you again for all that you are doing and giving! A special thanks to those that are sharing this project with their sewing guilds, and working together to create several quilts for this program. Thank you so much for your overwhelming desire to help the little ones in need at the Baltimore headstart program. Several of you have asked about dates? Since none of the quilts will be distributed until there are enough for everyone (55), let's set a goal date of March 31st. From the responses I have been receiving I think we can meet the goal of 55 by that time. Remember, all quilts received after the initial distribution will be given to new children as they enter the program. 3 gender neutral quilts, for three sick little ones coming into the program, gender unknown at this point. Sizes...the program director asked for small quilts, so I'm thinking anything from 32" x 36" to crib size 50" x 53", and anything in between these sizes. When I told Melissa of your immediate support, she was overwhelmed with gratitude. Here's a photo of her in class, carrying 20L of water, which many families have to carry over 5K to have to clean water on a daily basis. She said she was having a hard time toting that container in the classroom, much less 5 kilometers. Thank you again for your amazing and loving support! My amazing daughter Melissa, who truly has the tenderest of hearts is finishing nursing school @ Johns Hopkins in Baltimore, Maryland. Part of their clinicals is to do some work in the community. Her recent focus has been working with disadvantaged babies at the Southeast Early Head Start program. These little ones come from very heartbreaking situations...AIDS babies, drug addicted babies, babies removed from their homes and families, little ones who literally have nothing in the world. When Melissa was telling me about the program, I said, "they need quilts, these babies need quilts". She said that there were 55 little ones in the program, and there was no way I could come up with that many quilts...little does she know about the love and generosity of all of you! Sizes...the program director asked for small quilts, so I'm thinking anything from 32" x 36" to crib size 50" x 53"
The immediate need is for 55 quilts, but if they receive more they will begin to issue a quilt to every child that enters the program. If your guild, church group, or sewing buddies don't have a charitable organization, this would be a great one to adopt. Is anyone here part of the the Baltimore MQG? If so, would you contact me at cherryhousequilts at gmail com. It has been weeks since I posted...that's not good. If I were to tell you the upside down, backwards, rollercoaster of a time I've had since Market, you probably wouldn't believe me. To tell you the truth, I don't believe myself...I'm not exaggerating here, it's been insane! There have been many miracles which is always something to be grateful for, and I am...but I'm still overwhelmed, and reeling by all that has transpired. Lizzy is finally getting settled in SLC, which is great! Does anyone in SLC have a good sewing machine she can borrow, or buy for next to nothing? I couldn't let her take mine, and her machine is on its last leg! All of the other stuff? I can't even talk about it without crying like a little girl. I need to see the blessing that this is for others, and I'm just having a hard time with it right now. Consequently all of this stuff pushed me over some invisible edge, and I've been sick sick sick :-( Today is the first time that I have finally started to see some light, and start to feel better. The sun is shining, outside as well as in, and I'm so thankful! Thank goodness Lizzy didn't take Finn, that might have been the end of me. I do apologize that these blog posts of late have been so down...by nature I'm not a Negative Nancy, I'm really not. I'm cheerful, and go through much of life in my own little colorful world. On a happier note, the House's House quilt is finished, and will be a published pattern soon. The Silk Tempest (do you guys know about that?) will be out as a published pattern soon as well. My sewing room is fully functional again, and all my queued up quilts are waiting patiently in line. Thank you for the kindnesses you have shown me, the messages and emails sent...I'm more grateful than you will ever know. Okay, one more day of rest, then back to the work of sewing; that is often my salvation. Thank you so much for your kind outpouring of support in regards to my story. It is hard is talk about, and your gracious kindness is humbling to me. Since it isn't a subject I discuss often, I am always taken aback by how prevalent domestic violence is, and how many lives it touches. I'm a little under the weather, and Market is days away, so this will have to be brief. The sisterhood of women is a beautiful thing, and I am so grateful for all of you! Screw up, errors, and starting over! Are you keeping up with the blog tour? Two more stops to go!!! It's gone by so fast, it's been amazing. I was nervous, you know, that kind of nervous feeling you have, when you think no one will come to your party that you worked so hard to prepare? Well, I was a little worried no one would come to my traveling party, but you did, and you have, and everyone is still hanging in there together. Thank you, from the bottom of my heart, THANK YOU! I'm so excited for the peeps (thank you Lizzy) that win the fabric, and the books! Are those fat quarters gorgeous or what? Okay, during the whole interview (x13) process, I had lots of thinking/reflecting time, and one of the things I thought about was my process for making quilts. Where I make them, how I work, shoes/no shoes...shout out to the no shoe sewers! Things that are part of the process to all quilters & makers of stuff. I got to thinking about mistakes - mistakes in judgment, mistakes in work, mistakes in colors; you know mistakes - we all make them. 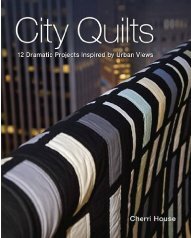 So, I wanted to share an experience I had, in making one of the quilts for the book (City Circle I believe) since you have said in your tour comments that you want to know more about the process of it all. First, you all know that planning anything on paper, can have relatively little to do with the outcome (quilts, marriage, children...you know). So I planned the quilt, made the blocks, started constructing the quilt, and one of the blocks was wrong...just wrong. It was a green block, and it stuck out like a sore thumb; unfortunately I didn't realize that it didn't work until I had sewn it to all the other blocks...what to do, what to do? Of course, I didn't have time to rip it out, make a new block, and sew it all back together...I just didn't have that kind of time. So, I sat miserably looking at the puke green block, trying to figure out if it was worth it to rip it out, and start over. I must have wasted 30 freaking minutes trying to make a decision. The one thing that went through my mind over and over again was, "how bad will I hate myself, and this quilt if I don't change it?" That was it, that was the deciding factor...I had worked too hard on the whole quilt, to hate it, over one stupid block. This, of course was not the first time I had this kind of incident; and I knew it wouldn't be the last. I decided that I was going to time myself, I was going to time how long it took to remove the block, make a new block, replace the block, and sew everything back. I looked at the clock, and 18 minutes later I was done. 18 minutes - that was all it took to save the quilt, save my sanity, and fix a problem that would have bugged me forever. It was worth it...it was so worth it...best 18 minutes ever! I wasted more time debating, then I did fixing...silly, right? Moral of the story - if you can't live with it, fix it...just rip it out, get it right, and be happy with the end product. My 2 cents on that! Here's a pic of City Lights - strangely it hasn't been in any (many???) of the tour photos - funny since it is the cover of City Quilts.